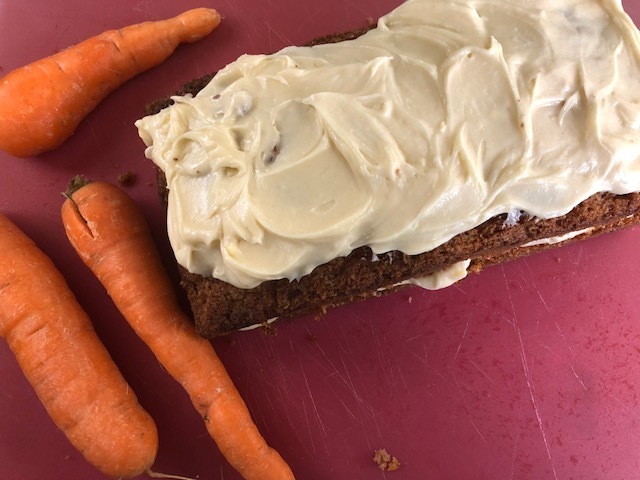 This is a very easy carrot cake using ingredients you probably already have in the cupboard and fridge that takes very little time to throw together. It was really light and moist and absolutely delicious! 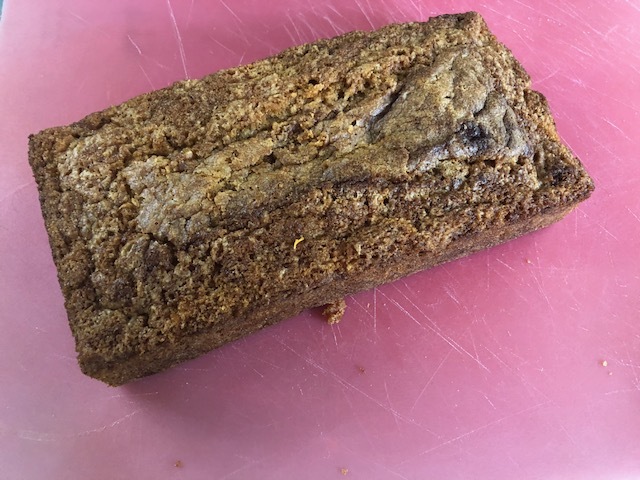 I didn’t actually realise it was a loaf cake until I was part way through the recipe but it makes baking and decorating it much easier. 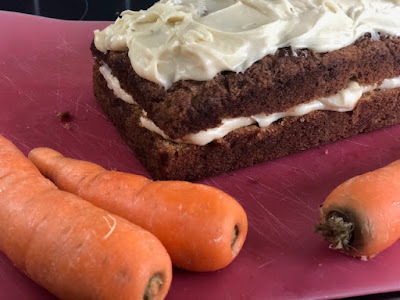 I made this while my baby daughter was having a nap, as my mother in law was having friends over the following day and had invited us to drop in and mentioned not having had time to make a cake so I wanted to help (though in the end she made a fantastic coffee cake as well!). This recipe comes from the Abel and Cole Cookbook, which I bought (I think on a special offer) back in the days when I had a veg box delivered every week. These days it doesn’t seem worthwhile as my husband is very fussy particularly when it comes to veg and we wouldn’t get through even their smallest box, though now we’ve started weaning our daughter maybe it is something to look into again! Abel and Cole has a similar recipe on their website where they say they spruced up the recipe from their first cookbook, which is the considerably simpler one that I made. Preheat oven to 180C. Beat the sugar, oil and eggs together until well combined, then fold in the flour. 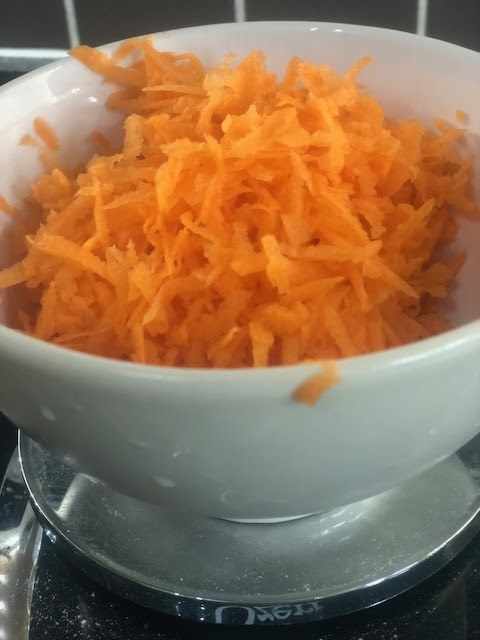 Stir in the grated carrots, the baking powder, bicarb of soda, salt and cinnamon. 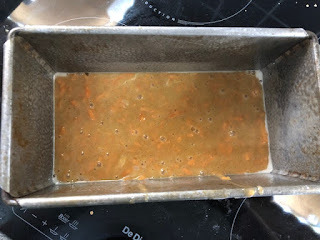 Grease a loaf tin - I use PME Release A Cake Spray 600 ml - and pour in the cake mix. Bake for 30 minutes, testing with a skewer, then turn onto a wire rack to cool. To make the icing beat together the cream cheese, butter, icing sugar and vanilla. Slice the cake through the middle (this wasn't in the original recipe but I decided to do it and loved it) and spread over one half of the cake and sandwich together then use the rest to cover the top of the cake. I'm sharing this with Baking Crumbs hosted by Only Crumbs Remain and CookBlogShare hosted this time by Monika at Everyday Healthy Recipes.